As touring and festivals continue accounting for the larger share revenue within the music business, the live concert industry is projected to reach a market value of $31 billion worldwide by 2022, with ticket sales alone generating an astounding $23 billion. In 2017, the rapidly evolving segment drew $5.7 billion in revenue, notably climbing 16% from the 2016 total, driven by a 5% increase in average ticket pricing. As the festival circuit also becomes a more commercially televised experience, with the entertainment industry shifting to a mobile-first on-demand model, more mainstream and emerging festivals alike are choosing to live-stream sets. Seeing these two trends skewing up and to the right, an opportunity risen for a network to surface solely dedicated to bringing these live music events directly to any screen. Founded in 2009, LiveXLive is a premium digital media company that delivers real-time coverage, commentary and performances from live music events across the globe. Following the blueprint laid by legacy networks like MTV and ESPN, respectively dedicated to covering music and sports, LiveXLive looks to own and solidify the same immersive approach to capturing the world of live music. The company aims to achieve this by landing exclusive partnerships and licensing agreements with power players spanning every segment of the industry, from AEG and Live Nation, to top ticketing giants and prominent venues. Already landing formidable deals with industry leaders like Live Nation, AEG and Insomniac, LiveXLive currently boasts a growing roster of over 27 festivals including EDC, Life Is Beautiful, HARD Summer and Rock In Rio. The company unveiled their first fully-integrated broadcasting partnership with prominent Hip Hop festival Rolling Loud, exclusively streaming performances across stages, in addition to integrating real-time fan reactions and introducing the Live Zone — A dedicated live set that featured artist interviews and commentary anchored by a curated roster of on-air talent such as Speedy Morman, Pierce Simpson, Shaheem Reid and YesJulz. The livestream of Rolling Loud 2018 attracted over 3 million viewers throughout the two-day event, more than doubling the festival’s previous viewership in Oakland and Miami. The company successfully streamed over 41 hours of content, including a slate of original programming broken into 13 episodes, launching shows like Mixed Signals, Lucky Few and T-Minus. LiveXLive also captured the sets of over 85 artists, tallying a staggering 300 million social impressions associated with the imprint. 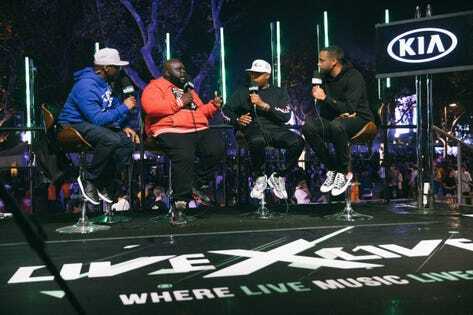 Functioning similar to ESPN’s Sporscenter and live coverage, the Live Zone aired more than 75 artist interviews, sharing the stage with notable superstars such as Nas, Lil Yachty, Nipsey Hussle, Juice Wrld, Rich the Kid and Blocboy JB. Mitchell: The live event space isn’t normally leveraged as a platform to develop original programming or establish a network — What makes this approach differently and ultimately more valuable? Robert: We’re all about live music and capturing the live experience. Similar to how ESPN built Sportscenter as their flagship program, we’re applying the same approach to music. The advantage is that music is arguably much more immersed in pop culture — crossing over into fashion, art and various sub-cultures. We’re able to integrate all of these things into original shows and our live coverage. We’re very fortunate to have partners, such as the founders of Rolling Loud, who are creating these incredible music experiences. We’re teaming up with them to bring these festivals to life in a new way. We deliver red carpet, back stage and green room interviews, while also creating organic shows that seamlessly tie into these experiences. Mitchell: As we see the continual convergence of music, marketing and technology — What do you see as the future of live events and how these industries work together? Robert: You can turn on your television and watch the AMAs or The Grammys, but nobody ever really gets to see the live experience. There’s an even bigger problem that starts with discovery. I sit in my office with powerful people across music, content and technology — And nobody knows all of the top live events, or even have a list of all the live events happening in Los Angeles. In New York, there’s probably 500 live events happening on one night in a weekend. For that reason, the focal point driving the next iteration of our app is discovery. It’s about consumers actually knowing where things are happening so you have the opportunity to see it. In the end, what we’re really delivering is a digital festival. Every day, at the tap of your finger, you will have the ability, at to access live music events around the world. With the help of our partners that have all built these amazing experiences, we can give millions of consumers the best seat in the house. Mitchell: What is the unique experience you want to create at these live music events and festivals? Robert: The heart of each experience is the Live Zone. From there, we roll out extensions in the form of original programming. At Rolling Loud, we introduced 5 original programs, using the platform to shoot pilots and experiment with original programming ideas that will continue to grow. We want to create shows that travel, moving from festival to festival around the world. By doing that, viewers can follow their favorite artists across the festival circuit, while also being able to build a community of fans around these artists. We want people to be able to actively follow their favorite festival, favorite artist and favorite genres year-round. Mitchell: Considering these different partnerships you’ve established and the vision going forward — How would you describe the business model you’ve created? Robert: If you look at the Live Zone experience we presented at Rolling Loud, Kia was our presenting sponsor. It was magical seeing all of the hard work we invested over four years manifest. We spent a lot of time and money programming the experience. It’s important that we create a quality product, then identify the right brand partners to execute. Now, we have enough content to keep it going, which allows us to partner with more brands to deliver these custom experiences. We recently announced Samsung as a partner, with the vision to integrate VR and 360 video. There are differing opinions about where VR is going, but we believe it will enhance these events in incredible ways. Imagine having the LiveXLive app, then receiving an alert that Lil Wayne is brining out a surprise guest, nobody else knows that is going to happen, you put on your VR glasses and can now view that experience like never before. We want to be right there for the consumer to give them access to these special things that happen during live music events. Mitchell: You enlisted a roster of emerging hosts and personalities that are new to the space — How important is it for you to introduce fresh voices to this evolving industry? Robert: It’s important to balance having older, established voices with fresh new voices. Nobody has done it consistently, or really aggregated the best combination of talent on both sides. I think it’s important to have young voices growing and maturing as your brand is maturing. We want to develop superstars with voices that can be trusted to talk about music, like we had in the old days of MTV and other traditional music networks. Mitchell: Describe the evolution or different pivots you’ve made as a company to this point? Robert: The most recent pivot we’ve made is partnering with Insomniac. They are a thought-leader in dance music, and have provided us with an abundance of programming specific to that genre. Now, we’re applying the same template to each genre of music. Having that breakthrough and striking partnerships with Live Nation and AEG was also really critically important. Being able to partner and have access to their portfolio of festivals is huge for us. These powerhouses have spent years developing amazing live experiences and programming across genres, all around the world. We want to take their programming that regularly reaches hundreds of thousands of people, and deliver it to tens of millions of people. Mitchell: Where do you see your company and this network going in the next 3-5 years? Robert: What we’re focused on and will continue to do is build communities. We’re a technology company first, and a mobile-focused company. We recently bought Slacker Radio, so we’re looking to deliver a fully immersive experience to your home and everywhere in between. We want to give the consumer the ability to see these amazing events around the globe, while simultaneously being able to chat, message, comment, buy a ticket and buy merchandise. We want to assure every music fan has the best seat in the house, even if they live thousands of miles away. Mitchell: What have been some of the notable challenges you’ve faced getting this network off the ground and breaking into a new space? Robert: We learn a new lesson at every festival. We’ve been shut down in the middle of the night before. We’ve had artists not show up for their set. If LeBron James doesn’t show up for a basketball game, there isn’t much you can do, because the fans have already paid for that game. The same applies when an artist doesn’t show up. There are a lot of lessons, but the biggest takeaway we’ve learned is that you need the right partnerships. It’s about being able to create brand new revenue streams and opportunities for us, brands, artists and the festivals we partner with. We’re giving everyone an opportunity to participate in live, so without those partnerships with Insomniac, Live Nation and AEG — We wouldn’t be able to make it. Getting to this point took a really long time, we’ve watched a lot of people try, but never do it successfully. We’ve been able to make these powers in the industry real partners who participate at every step, which is a win in this. We had to make sure that happened, because they have a way bigger influence on the artists, and ultimately a way bigger influence on the experience. We’re just enhancing the experience by giving consumers who don’t have the ability to attend for whatever reason real-time access. This ultimately creates an entirely new revenue stream for the entire music business. Mitchell: When you reach that point and these things come to fruition — How do you see the big players across industries responding to this paradigm shift? Robert: When you think about streaming and how long it took for that industry to develop, or if you look at companies like Napster — It took an extended period of time for everyone to understand the space and participate. Today, in these spaces, everyone is winning. It’s the same in our case. When it comes to live music events and the players driving them, I’m not taking their content, I’m producing it. We’re producing the product, putting our own money on the line, and we’re taking the risk. We’re producing, directing and distributing original programming. We’re taking the biggest risks on the front end, allowing everybody to win on the backend. The more we are able to bring these live experiences to life, the more big players and consumers can benefit from it. We had 3 million people view Rolling Loud in a two-day span. I see that number easily increasing to 10 million in the very near future. The artists have these massive social reaches, so why not extend these experiences to all of their fans? Lastly, what we’re proving is that content is king, but distribution is King Kong. At the end of the day, if you don’t have the best content, go home. We’re not here to curate content that is solely intended to drive traffic. We’re here to create the best content that’s been creating in music over the last 25 years. We want to deliver original programming fueled by the best artists in the world.